Why do some business people in creative industries thrive, while others flounder? If you own a business you'll know the roller-coaster ride feeling it gives you - the thrilling ups and the terrifying downs. In this book, Trudi identifies the six fundamental ingredients that create a thriving business and help you enjoy the ride. "...This beautifully written book takes the reader on a unique journey and provides practical insights that will help any business of any size and shape. It blends the importance of being (and staying) creative with good solid business acumen. This book is a testament to where passion, creativity and sound business skills can take you. I hope you enjoy it as much as I did." 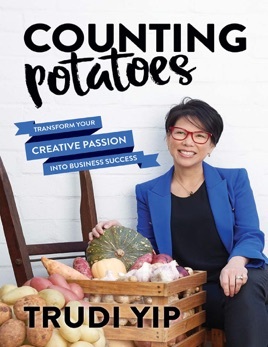 "...Counting Potatoes is an invaluable source of business knowledge, and the next best thing to having a mentor."